With the kind sponsorship from Kuala Lumpur Kepong Berhad, the Tan Sri Lee Loy Seng Perak Grand Chess Championship 2011 will continue to be held this year. This championship is held in memory of the late Tan Sri Lee Loy Seng. Tan Sri Lee Loy Seng is the founder of Kuala Lumpur Kepong Bhd, one of the leading plantation owning companies and based in Ipoh, the capital of the state of Perak in Malaysia. Last year, the inaugural Championship was played over 9 legs in 7 different towns in 7 different districts in Perak. Over 900 players took part, some coming from other states. This year's championship kick off at the Taiping Chinese Recreation Club on 10 April 2011. 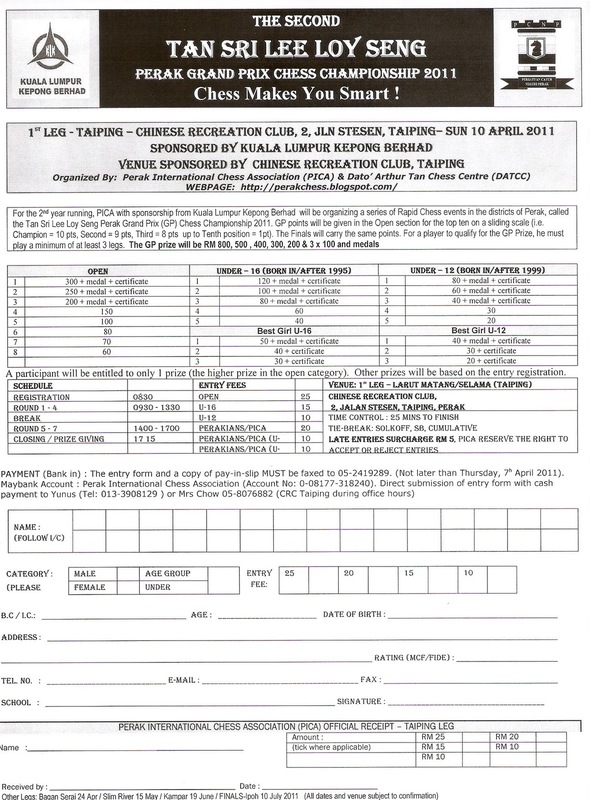 Below is the entry form with details inside. Please download and follow the instructions in the form.